For a thicker smoothie, use frozen fruit. Use any type of juice. 13 Comments for "Popeye Power Smoothie"
I used a can of pineapple chunks, and used the juice from that for the smoothie. Then put the rest of the pineapple chunks and juice in a containter as a snack for later! Canned crushed pineapple in juice works very well as a substitute for the pineapple juice. Great suggestion!! Something I normally have in the pantry :). We always come back to this recipe since everyone loves it. 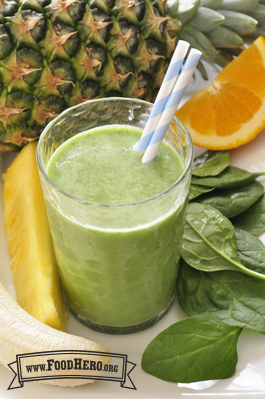 Kids who initially say they don't like spinach change their minds after tasting this Smoothie. We also received favorable taste test results when we substituted 1 1/2 cups of kale for the 2 cups of spinach--another great, green variation! It looks good. Is the sugar content on the nutrition label based on using plain yogurt or vanilla yogurt? There are now two nutrition labels to show the difference between plain and vanilla yogurt. Thank you for asking! Kids and adults love this smoothie! We did this recipe at an elementary cafeteria tasting and I had many parents come up to me in the weeks afterward and tell me that their children insisted that they make this recipe at home. My own kids request it at least once a week. I've had 100% success in getting spinach haters to actually *like* spinach when we've made this recipe in class (it's better if the haters are the ones making the smoothie). I like to use a traditional blender, not a handheld one, to chop the spinach super fine. I love this recipe! It's definately the best way to eat spinach. Tips: blend the smoothie really really well so that all the bits of spinach are chopped up. I peel and freeze my old bananas to add to my smoothies so they are nice and thick. Kids love it! This smoothie tastes WAY better than it looks. You can't even taste the spinach, but you're still getting all the healthy nutrients from it! Yummy! Tastes great and love the thickness. The spinach leaves really makes it as we tried it 1st without them. And kids love the color too! Oh, we have tried this with vanilla, strawberry and blueberry yogurt, and most of all love the blueberry!!! Also we often use only one type of juice, whatever is on sale that week. Kids love this recipe- and so do I! All the nutrients from spinach with the taste of what my students call "healthy bubblegum!" The green color is a little deterring, but the flavor is truely great! The pinapple juice keeps it very fruity!